Local Kansas City, MO Boulevard Brewery Company recently completed a striking addition to their plant in order to fulfill their orders. Designed by local firm El Dorado Inc, the new beer cellar sits on top of the existing plant and is a light-filled space. The glass volume holds eight 300-barrel tanks dedicated to dry hop beer. 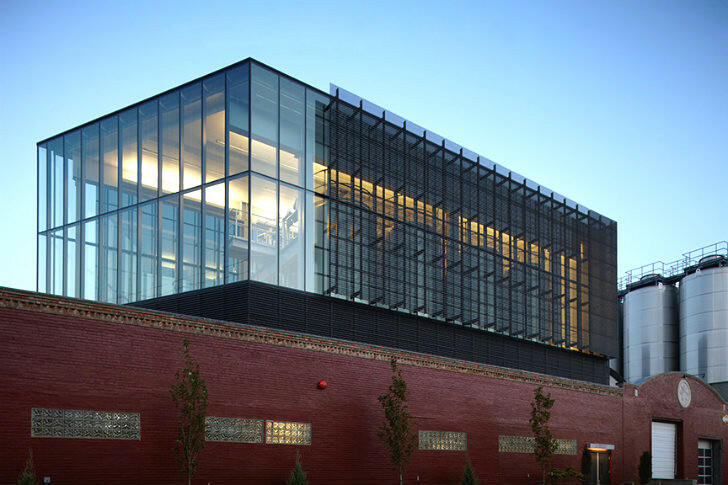 Metal mesh screens grace the sides of the volume to control the infiltration of heat and sunlight into the space, while other energy efficiency strategies bump up the performance of the expansion. Boulevard Brewery is located at the corner of 25th Street and Southwest Boulevard in Kansas City, MO and they were in need of additional space to hold beer during the brewing process. Working within the existing facilities, the brewery and their design team at El Dorado decided to locate the new cellar on top of a building. While designing the ironically named roof-top cellar, the team discovered there was an underground river that runs below the northwest corner of the building, channeled by dual 9′x18′ box culverts. Embracing this development, the team sheared the north side of the addition to run parallel with the river and also engages southbound traffic emerging from under a rail overpass. 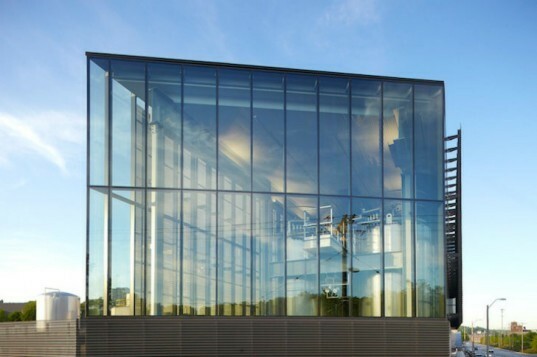 The glass volume holds 8 beer-brewing tanks that are essential to the production of hops beer. To minimize solar heat gain and maximize daylight, the space features a metal mesh screen on the outside of the northwest and southwest facades. When lighting is needed, the addition makes use of high efficiency T5 fluorescent light fixtures on motion detectors throughout the building to reduce energy use. Natural ventilation keeps the space cool by utilizing the tank temperature differentiation to achieve a natural stack effect in the tower. The roof is covered in a cool, reflective TPO membrane, and the volume features low E-insulated glazing and a heavily insulated wall system filled with blown-in foam. Completed in the summer of 2012, the new cellar provides extra space for needed equipment and gives an updated, modern face to the brewery. Boulevard Brewery is located at the corner of 25th Street and Southwest Boulevard in Kansas City, MO and they were in need of additional space to hold beer during the brewing process. Working within the existing facilities, the brewery and their design team at El Dorado decided to locate the new cellar on top of a building. While designing the ironically named roof-top cellar, the team discovered there was an underground river that runs below the northwest corner of the building, channeled by dual 9′x18′ box culverts. Embracing this development, the team sheared the north side of the addition to run parallel with the river and also engages southbound traffic emerging from under a rail overpass. The glass volume holds 8 beer-brewing tanks that are essential to the production of hops beer. To minimize solar heat gain and maximize daylight, the space features a metal mesh screen on the outside of the northwest and southwest facades. When lighting is needed, the addition makes use of high efficiency T5 fluorescent light fixtures on motion detectors throughout the building to reduce energy use. Natural ventilation keeps the space cool by utilizing the tank temperature differentiation to achieve a natural stack effect in the tower. The roof is covered in a cool, reflective TPO membrane, and the volume features low E-insulated glazing and a heavily insulated wall system filled with blown-in foam. Completed in the summer of 2012, the new cellar provides extra space for needed equipment and gives an updated, modern face to the brewery. Diagram showing the new cellar volume and the underground river.